Players of our games take on the roles of paranormal investigators, i.e., detectives who solve paranormal mysteries. For this reason, our basic narrative unit is a case (as in a case solved by a detective), which corresponds roughly to a quest, mission or level in many other games. A case typically takes 45-90 minutes to solve and should offer some degree of closure at the end. While the case is our main overarching narrative unit, it consists of smaller narrative parts, or encounters that are geo-located and linked together. During play, a player investigates one encounter at a time. Completing one encounter unlocks one or more in the chain. Our engine allows the encounters to be linked in a sophisticated fashion. The resulting experiences can be non-linear and personalized, such that different players playing together will get different experiences, which also improves replay value. Sequential: One encounter is active. Completing the encounter unlocks the next. Parallel Inclusive: Multiple encounters are active and can be found in any order, but all must be completed to unlock the next. Parallel Exclusive: Multiple encounters are active and the player chooses a single one, which when completed eliminates the others. The launch version of our game Bram Stoker’s Vampires contains a single case with a total of eight encounters. The first three encounters are the three vampire sisters that I introduced in the previous post, followed by four encounters with Count Dracula and one with Bram Stoker himself. We structured the encounters with the three sisters as a parallel inclusive structure, which means that the player can find them in any order. In game terms, this means that the player will see three blips on their paranormal radar and can choose which spot to investigate first. These parallel encounters are linked sequentially into the overall progression, meaning that the player must find all three sisters in order for the subsequent encounters (with Count Dracula) to be unlocked and the game to progress. As a narrative structure, this is a simple 3-way branching structure where the three paths join immediately. 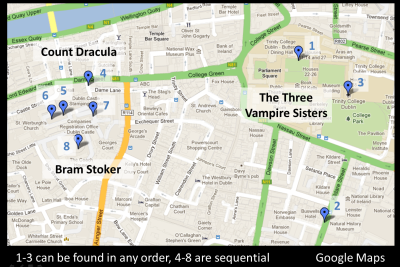 The figure below shows the map used for the launch version of the game that began on 26 October 2012 in collaboration with the Bram Stoker Festival. As noted in the figure, each of the subsequent encounters are linked in a sequential structure. 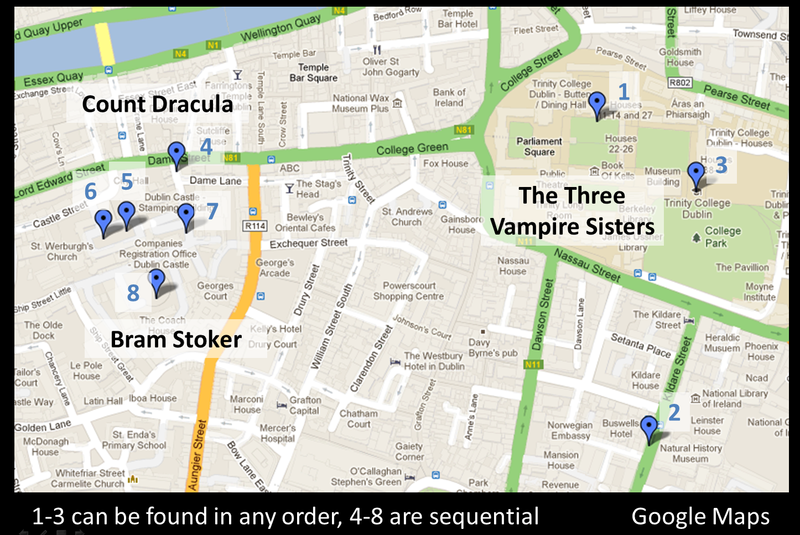 This means that after the encounters with the sisters, the experience is linear: Each player will encounter Count Dracula and Bram Stoker in the same order. 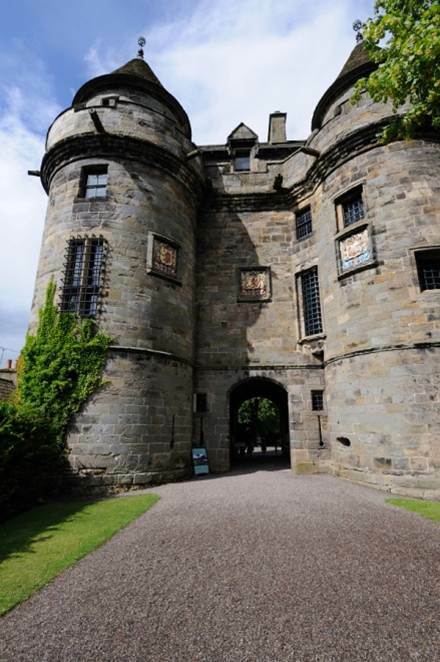 An example of the parallel exclusive structure is found in our game Falkland Ghost Hunt that was set in the gardens of Falkland Palace (see photo above) in Scotland. 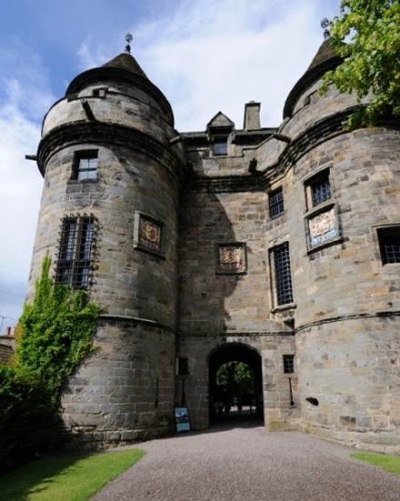 In this game we used an important character from the castle’s history, Mary, Queen of Scots as a quest-giver who was in opposition to a fictional figure, the Banshee. In our story, the Banshee had awoken the castle’s spirits, which the player could then encounter in a series of cases set in the castle grounds. In this fashion, the story about Mary and the Banshee worked as framing device in which a varying number of other stories could be set. The map above is an artist’s depiction of the castle gardens. The red lines show the framing story and the yellow lines one of the framed stories called “The Grey Lady.” Grey ladies are of course classic ghost characters found in many old castles and mansions throughout the Western world. In this particular instance, we decided to compose our own story about a woman whose young daughter died in a fire in the castle. 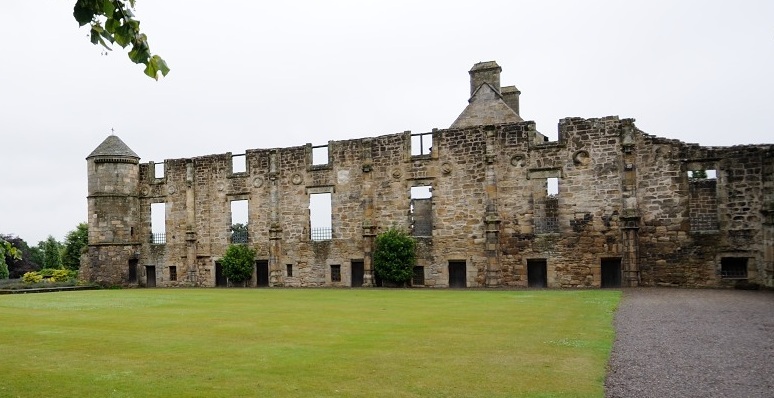 Historically, there was a fire in the castle during which the East Wing burned down (see photo) but we don’t know if any children died. In “The Grey Lady,” the mother roams the garden, distressed and shaken, searching for the daughter. When the player encounters the mother (marked 1 on the map), she begs for help to find the missing child. The next two encounters (marked 2a and 2b) use an exclusive branching structure. Both serve a similar function in the story in that each constitutes a trace of the missing child: one (2a) a shoe and the other (2b) a poppet (doll). After the initial encounter (with the grey lady) both of the parallel exclusive encounters appear on the radar. The player has to choose which to investigate and the decision precludes exploration of the other encounter. After either the shoe or the poppet has been found, the third encounter is the child itself, who is of course placed by the ruined East Wing of the castle (see photo). The examples in this post have shown the three main narrative structures available in our game engine. As a theoretical point of interest, we note that it is possible to represent an N-ary parallel inclusive structure as an N-depth parallel exclusive structure where the first decision point has N choices, the second N-1 and so forth. The different structures have different effects on the experience. 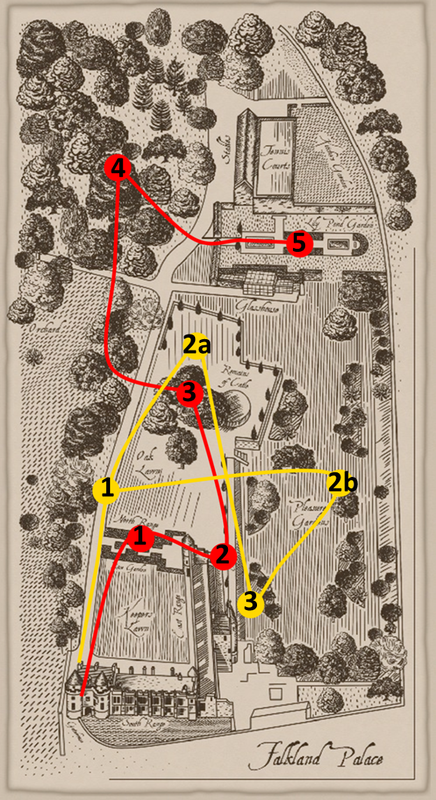 A chain of sequential encounters feel somewhat like a tour or a mystery: the player is led from one encounter to the next, following a trail of story segments. A parallel inclusive structure implements a collection game mechanic: the player has to complete all three encounters but can do so in any order. The parallel exclusive structure is intended to make the experience feel more dynamic through the introduction of apparent uncertainty: the player doesn’t know what happened with the radar blip that disappeared — whether the ghost moved or disappeared for other reasons. Katsiaryna Naliuka, Tara Carrigy, Natasa Paterson and Mads Haahr, ‘A Narrative Architecture for Story-Driven Location-Based Mobile Games,’ Springer LNCS, Third Workshop on Story-Telling and Educational (Serious) Games (STEG’10) , Shanghai, China, 8-10 December 2010. Tara Carrigy, Katsiaryna Naliuka, Natasa Paterson and Mads Haahr, ‘Design and Evaluation of Player Experience of a Location-Based Mobile Game,’ 6th Nordic Conference on Human-Computer Interaction (NordiCHI 2010), Reykjavik, Iceland, October 16-20, 2010, pp 92–101.